How can data-driven approaches improve the sustainability and resilience of food systems? And can these approaches be successfully applied in the livestock sector? In October, members of the LD4D community met in Nairobi to participate in the CGIAR Platform for Big Data in Agriculture Convention, which brought together agriculture and data scientists from around the world to share their innovative tools and approaches. Due to its unique role in bringing together livestock data producers and users, LD4D also acts as the CGIAR’s Big Data in Agriculture livestock data community of practice. The convention presented plenty of ideas which could offer inspiration to the LD4D community. One area of the meeting where livestock featured strongly was the Animal Data Safari. This dynamic interactive session allowed for flash presentations and poster displays and helped to raise the profile of the livestock sector within the meeting. Among the work presented included a mobile phone-based syndromic surveillance system that has been used in northern Kenya for early detection and control of livestock diseases. Bernard Bett and colleagues from the International Livestock Research Institute (ILRI) shared how the system has been expanded cover food safety (capturing meat inspection records in abattoirs) and track the types and volumes of veterinary drugs sold in local agro-veterinary shops [download the presentation]. Participants shared ideas and innovations at the Animal Data Safari. Photo credit: ILRI. 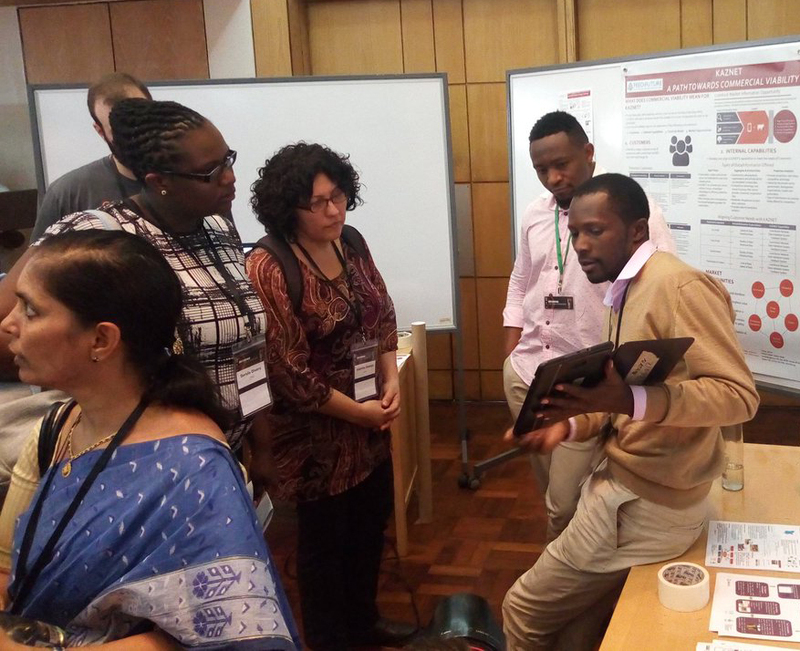 Stephen Oloo and Catherine Pfeifer (ILRI), shared their work on automating Demographic and Health Survey (DHS) livestock data requests to provide insights about livestock ownership across Africa [download their presentation]. Meanwhile, ILRI’s Mark van Wijk presented innovated uses of the RHOMIS database, which contains data on farm level-indicators from 18,000 smallholders in 22 countries, to quantify the role of livestock in smallholder livelihoods [download his presentation]. Mark will present this work to the wider LD4D community at the CoP meeting later in November. Beyond the Data Safari, the conference provided an opportunity to explore different means of encouraging data interoperability. Cheryl Porter from the University of Florida, shared her work on AgMIP: the Agricultural Model Intercomparison and Improvement Project, which focuses on enhancing the interoperability of models using mapping files. They are also looking into machine learning as an approach for accomplishing this. These topics will also be explored at the November LD4D meeting. Similarly, there have been exciting efforts in the crop world to combine and analyse data from diverse sources. Christophe Bocquet from Dalberg Data Insights shared their work on combining survey and census data, drone images, Internet of Things (IoT) data and meteorological data in order to bring new insights to agricultural issues and enable data-driven decision making. For example, they are using data on telecommunication coverage and mobile use to track how people migrate – this could potentially be a way to count nomadic agropastoral communities. In general, the meeting was a good opportunity to network, hear current thinking and how other sectors addressing data challenges. It was also a chance to network with people from sectors working in the big data field. If members of the LD4D community are interested in big data we recommend participating in the 2019 meeting, virtually or in person. SEBI hosts and facilitates the LD4D community of practice. Louise Donnison is the Data Scientist for Supporting Evidence Based Interventions (SEBI), based at the University of Edinburgh. Karen Smyth is the Deputy Director of SEBI. Vanessa Meadu is the Communications and Knowledge Exchange Specialist for SEBI.